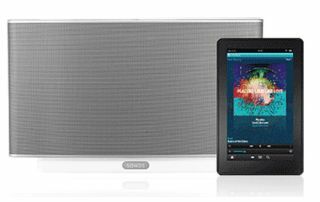 Amazon Cloud Player now available on Sonos | What Hi-Fi? Amazon Cloud Player is now on Sonos, allowing you to access your complete music library in the cloud via your Sonos system, including any Amazon AutoRip versions of your CDs and vinyl. Amazon Cloud Player is Amazon's cloud storage service, similar to iTunes Match and Google Play Music All Access, which stores your music and gives you to access from a wide range of devices, including Android and Apple smartphones and tablets. Available in free and premium forms, the paid-for version costs £21.99/year and allows you to store up to 250,000 songs. And now it's on Sonos, meaning anyone with a Sonos wireless hi-fi system can connect their Amazon Cloud Player account and play their library. This includes any tracks made available by AutoRip. This is the new service that gives you free digital versions of any CD or vinyl purchases. So you can buy a vinyl record from Amazon and be streaming a digital version on your Sonos system seconds later. More than 350,000 albums are currently available via AutoRip, look out for the logo to see compatible releases. Previously, access to your own personal library of music on Sonos had been limited to connecting a NAS device or streaming directly from Apple or Android phones. For more information, head over to the Amazon Cloud Player on Sonos website.